The Nova Scotia Duck Tolling Retriever, or “Toller” for short, is a dog with a truly superb temperament. Tollers are capable of adjusting to just about any home. They are a very energetic dog; able to put a lot of energy into just about anything that they do. Thought they are energetic, they are not hyperactive. They can adjust to just about any home and are great with the family. As an added treat, Tollers are even good with other dogs and pets. They are a protective breed and with that, they are wary of new people and strangers. Given enough time however, a Toller can warm up to just about anyone. Tollers are a very intelligent breed and learn fast and because of this, they can become bored and then difficult. This is not a hard situation to remedy though. All an owner needs to do is vary the activities between play time, walks and runs or what ever the dog enjoys. The upkeep of the Toller is not very difficult. They are a breed that likes to be with the family and they do not cope well with being kept outdoors because of this. An owner of a Toller should be able to keep their dog indoors so that the dog feels loved and can be around the family. They are energetic, so a large yard for them to run around in is a definite benefit. They are even more happy when they have kids to run around and play with. They have a relatively thick coat, so they are able to withstand mildly cold weather and can actually do quite well in it, so long as someone is there to keep them company. As far as grooming goes, it is not very difficult. All an owner of a Toller has to do is make sure to bathe and brush their dog regularly. A Toller needs to be brushed thoroughly at least once a week. The Toller doesn't have any major health concerns. They live an average life span of about eleven to thirteen years. Owners might want to periodically get their dog's hips and eyes checked to make sure they are functioning properly. The only major concern with the hips and eyes is as the Toller ages, difficulties might arise. Owners should also make sure that their dog goes to the veterinarian on a regular schedule. Regular visits to a vet are important to any pets overall well being and it is very important that the pet is up to date on their vaccinations. The Nova Scotia Duck Tolling Retriever has a very interesting history; one that every owner should learn. “Tolling” is integral to the dog as a breed. It means that the dog is used to bring curious ducks to the area. The dog fetches sticks and plays along the shore, which makes the ducks curious and they investigate. When the ducks are close enough, the dog disappears from sight and the hunter shoots the ducks. The Toller is then sent to retrieve the ducks. Tollers, in various forms, have been around since the eighteenth century in Europe and were eventually brought across the Atlantic. 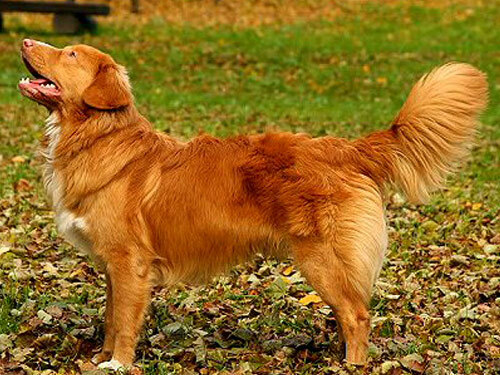 The Nova Scotia Duck Tolling Retriever is a relatively new breed when compared to some others. It wasn't until the 1960's that they were brought into America and it wasn't until 1984 that the Nova Scotia Duck Tolling Retriever Club opened. It wasn't until even more recently, 2001, that the Tollers were admitted to the AKC as an official breed. Since then, they have enjoyed a coveted place at shows and in the homes of their owners. They have proven to be more than just tollers and retrievers and excel in obedience, sportsmanship and are extremely friendly dogs. They are a true joy for anyone to behold, just as any owner will proudly admit.